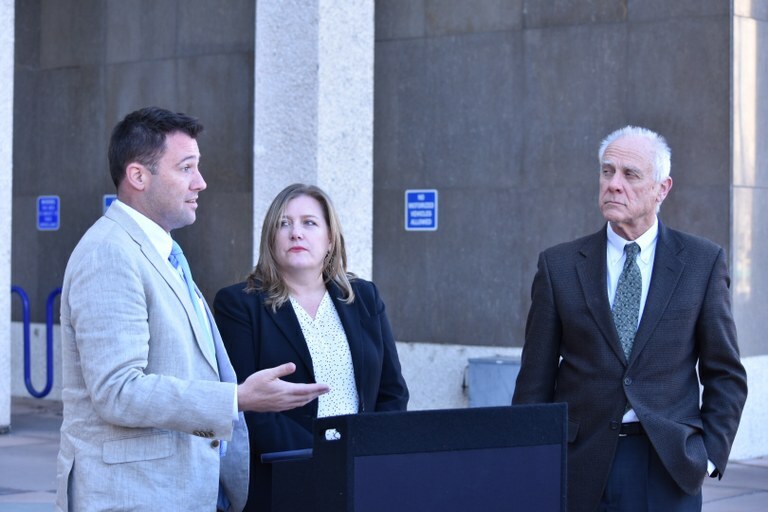 Today City Councilors Pat Davis and Isaac Benton joined Emily Kaltenbach of the Drug Policy Alliance to introduce an ordinance to decriminalize the possession of less than one ounce of marijuana in the city of Albuquerque. Under current the City of Albuquerque ordinance, possession of one ounce or less of marijuana is a criminal offense punishable by up to a $50 fine or 15 days in jail for a first offense, and up to a $500 fine or 90 days in jail for a second offense. The new legislation replaces the criminal penalty with a small $25 fine. “In 2014, 60% of city voters supported the decriminalization of marijuana, including a majority of voters in each of the nine Council districts. This bill reflects our community’s views on the matter,” said co-sponsor City Councilor Isaac Benton. A Bernalillo County Marijuana Decriminalization Advisory Question was on the November 4, 2014 election ballot and passed with 59.52% support, and support has continued to grow. A similar ordinance was proposed to go to the voters in 2015 but was vetoed by former Mayor Berry. The Albuquerque City Council then passed an ordinance on their own, but that ordinance was also vetoed by former Mayor Berry. In 2016 there were 177 drug violations that listed possession of marijuana as the highest offense. This represents thousands of hours of staff time and tens of thousands of dollars in costs for APD and the court system that could be spent otherwise. Officers still retain the discretion to charge under the state or federal law for serious cases such as those involving drug trafficking and impaired driving. The ordinance will head to the City Council Finance and Government Operations Committee later this month before heading to the full Council for a final vote.